Poetry Out Loud is a national recitation contest that is sponsored by the National Endowment for the Arts and the Poetry Foundation. The program is administered in partnership with the State Arts Agencies of all 50 states, the District of Columbia, the U.S. Virgin Islands, and Puerto Rico. Poetry Out Loud encourages students to learn about poetry through memorization and recitation; the Ohio competition is administered by the Ohio Arts Council. Each school year, the Ohio Arts Council invites all Ohio high schools to register for Poetry Out Loud. Registration for Ohio Poetry Out Loud is online; the deadline is Saturday, December 1, 2018. Register Your School. Registration for 2018-2019 Ohio Poetry Out Loud (POL) is online; the deadline is Saturday, December 01, 2018. Teachers may register students here (scroll down to click “Register Your School.”) Registered teachers are provided free multi-media poetry curriculum materials, training workshops and the services of a coordinator. Free Teacher Training Workshop. Ohio POL offers a free, no-obligation teacher-training workshop. Multi-media program materials, including curricula, are also free. 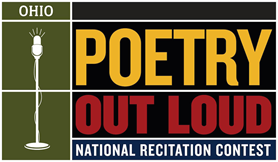 Poetry Out Loud is aligned with Common Core and National Council of Teachers of English (NCTE) standards. Teachers who wish to attend the free teach training workshop, should contact Kisha Nicole Foster, Poetry Out Loud Fellow, Cleveland/Northeast Ohio Regional Coordinator at cle.pol@cpl.org. Walk-ins will be accepted. Poetry Out Loud aims to expose students to shared literary heritage in poetry and to improve public speaking skills. It also helps teachers meet required NCTE and Common Core benchmarks in close reading, text analysis, and practice with complex texts, speaking, and listening. For more information about Poetry Out Loud, visit the national website at www.poetryoutloud.org.